Slow roasted garlic Confit is easy to make. It takes some time in a low oven and your house will smell amazing in the meantime. Pre-heat the oven to 250°F. Take a deep baking pan, fill it with peeled garlic cloves. 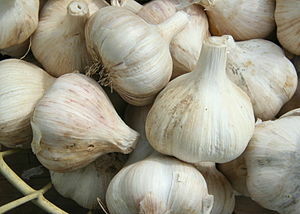 Cover the garlic with vegetable oil. Add a sprig of fresh thyme and a light sprinkle of salt. Cover the dish tightly with tin foil. Place the pan into the oven; overnight is best. If not overnight, then 4-6 hours. The confit is done when the garlic is soft. Remove from the oven and allow to cool before transferring into storage containers or gift jars. Use the garlic in sautéed vegetables, potato dishes, spread it like butter on bread, fold it into pasta or knead it into bread dough to make a roasted garlic bread. There are so many uses for this. Having a jar handy in the fridge is a real treat! Perfect for a gift from your kitchen. 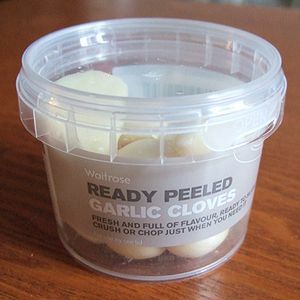 This entry was posted in Cooking, Recipes and tagged condiments, Confit, Garlic, garlic paste, garlic spread, roasted garlic. Bookmark the permalink. Wow Chef! Your photography skills are really coming along! The very first picture at the top is gorgeous. It is amazing how slow roasting changes the whole taste and character of garlic…it is so good.